Another tag on today in a bay full of whales and a spectacular sighting of a leopard seal eating a Gentoo penguin. As I write it is about 6:00 PM on Thursday night. It’s been dark for almost three hours and the snow is falling softly in the darkness as we follow our tagged whale, ‘Nacho.’ We’re moving slowly, at about 2 knots, and flurries of penguins are racing alongside the Gould, visible underwater in the ship’s lights. 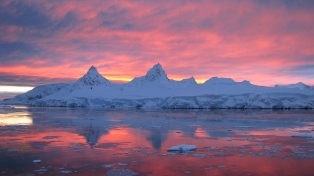 It’s been another spectacular day in Wilhelmina Bay. We had the two Zodiacs in the water at 8:30, just before a spectacular sunrise. Dave tagged ‘Nacho’ before 10:00 and the two small boats stayed with the whale all day, while the Gould mapped krill and surveyed whales, penguins and seals throughout the Bay. There is still a massive swarm of krill and a ton of whales in the Bay. Once again we surpassed the limits of our data collection software program, which was designed by someone who, quite sensibly, couldn’t imagine collecting more than 100 sightings in one day. 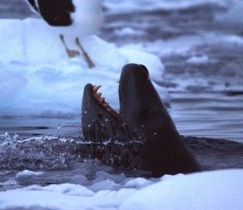 Last night we watched Alfred Hitchcock’s “Psycho” which turned out to foreshadow today’s highlight – a close encounter with a leopard seal consuming a Gentoo penguin. 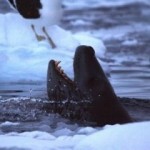 Lindsey first saw the leopard seal tossing something in the water and quickly realized that it had a penguin. (If you are squeamish, perhaps skip the next sentence or two). Leopard seals often skin penguins by flailing their bodies against the water’s surface, presumably so they don’t have to consume their pesky feathers. This seal was so energetic in its dinner preparation that the poor penguin’s head flew off and landed on a small piece of ice, at the feet of a grateful Kelp gull. Lindsey and Reny were so ecstatic in watching the demise of this poor penguin that the rest of us are now a little nervous around them. (OK, you can start reading again). So, a great start to our third and final leg. We’ll continue to track ‘Nacho’ overnight and hopefully recover the tag at first light tomorrow. Despite the short and rapidly waning periods of daylight and increasing ice coverage, we continue to have great success tagging whales and mapping their prey. 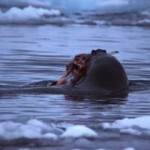 And it seems that everyday we get an amazing natural history bonus, like today’s leopard seal. I’m looking forward to watching snow, penguins and whales, and maybe more leopard seals, on my late night/early morning tracking shift. p.s. Happy Birthday Benjamin William Tyson!! Que’est que c’est? 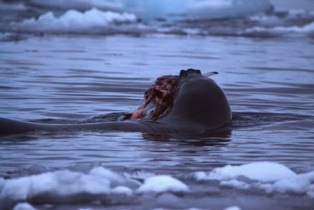 Talking Heads reference aside, the leopard seal dining show does sound raw and amazing. Good eye Linds. Happy beeps! you guys have been gone a long time and it is still May! The reports are pretty amazing. I just like the thought of being there, removed, isolated, complete in that world. Reny’s enthusiasm of the carnage should have you sleeping uneasy! But we love her anyway. 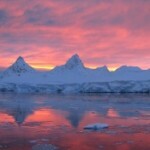 Love the blog, read it daily.